chosen from a design point of view but also because the design has meaning for me. 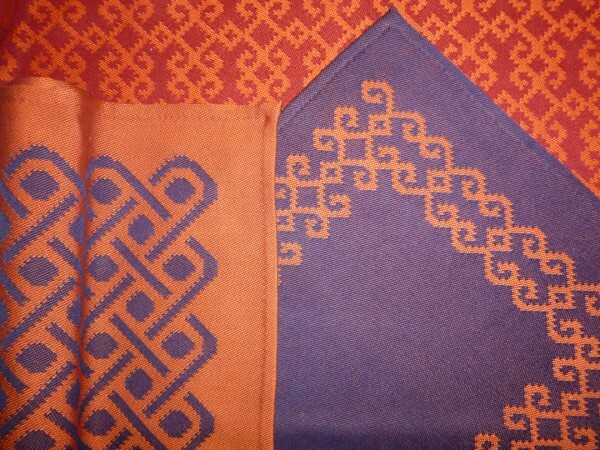 While the “hook” motif is used in their textiles in various forms including ikat and sotis (manipulation of warp floats), I have also seen it used in carvings. It was the experience however of being greeted at every village by the chief with a welcoming speech stressing the importance of relationships between us that has left a long lasting impression. Then, when our interpreter explained the dance as being another interpretation of the motif of linked arms the hook motif took on an incredible meaning for me. An added interesting fact about the “hook” motif is that I have come across an identical design on a fragment of a carrying strap from pre-Columbian Peru. (Symmetries of Culture, Dorothy K. Washburn / Donald W. Crowe, University of Washington Press, 1998). 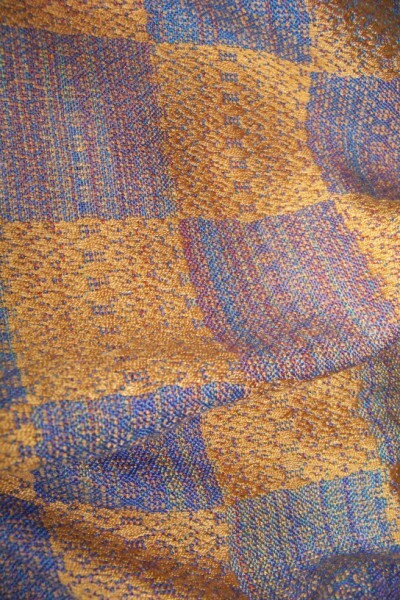 These scarves have used the weave structure of warp float manipulation that is used in West Timor. The hook motif has been used as an all over design. however the fact that I found it in a meeting place that gave it impact. “Meeting Place” has been a frequent theme in my work in recent times. I have been using the concept to illustrate the importance of having common ground for cultures to develop understanding and tolerance. experiences there: navy from indigo, red/brown from morinda (tree). The linked arms motif in the West Timor traditional structure of sotis, has also been interpreted into several interpretations as a 24 shaft design and used it as an all over motif. 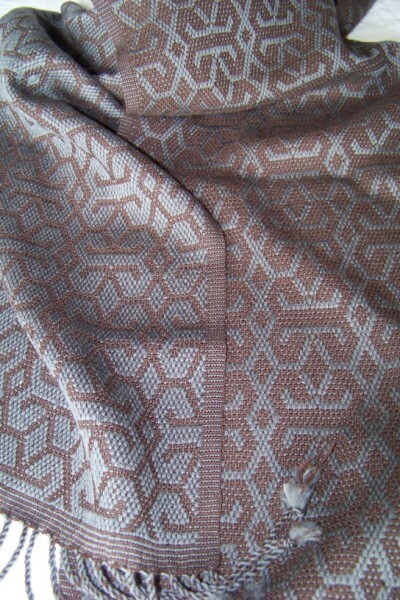 Both the following textiles use the design in different structures. In both cases the scale has been considerably reduced and you have to look to see it. I have also used ikat as a design element. 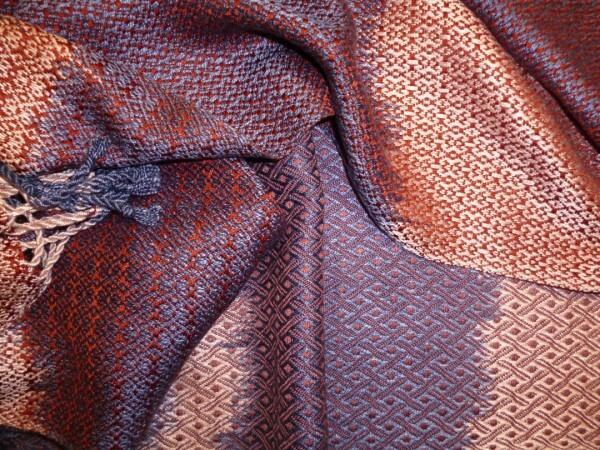 While the ikat style is totally different to the complex designs of West Timor, I have used it to reflect on the commonality of technique which is found in many countries around the world. This is a wonderful time in the garden. I thought that I would share the spectacular show of the weeping paperbark. It lasts for such a short time but it is well worth the wait. 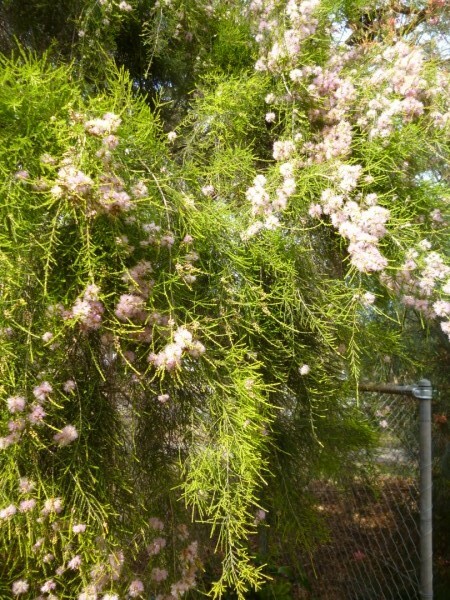 The soft pink flowers cascade down and totally cover the tree. You are currently browsing the Kay Faulkner's Blog blog archives for November, 2011.